In the wild, giant pandas are only found in coniferous and broadleaf forests in some of the most remote mountain ranges of China. Although they once lived in the lower elevations as well, humans have forced them out. They are estimated to be less than 1,900 giant pandas left in the entire world, including the population in zoos, putting them on the endangered species list. Review the list of facts below to learn what their life span is, how they develop, when they reproduce and other interesting facts about giant pandas. This information is written for both kids and adults. Click here for a great selection of Amazon.com books about Giant Pandas. Their diet consists almost entirely of bamboo (stalks, leaves and shoots). In the wild they will also eat small woodland creatures and different types of grasses. In captivity they are fed some fruits, vegetables, sugar cane, and rice. 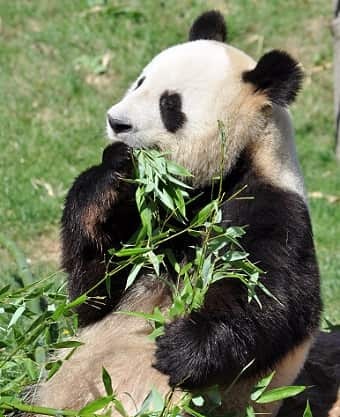 Giant Pandas have specialized wrist bones that they use as extended thumbs when eating bamboo. They also use their strong jaws and teeth to tear and crush the bamboo before eating. With a body similar to that of a bear, the distinguishing feature of a Giant Panda is that it is black and white in color. Black can be found on the ears, eyes, face, legs and upper body and the rest of the body is white. Giant Pandas are elusive in the wild which makes determining how long they can live very difficult. Captive pandas are known to live as long as 35 years, but scientists feel the lifespan in the wild is shorter. Male pandas can weigh as much as 250 pounds (113 kilograms) while females are never more than 220 pounds (99.8 kilograms). Giant Pandas reach four to six feet long (1.2 to 1.8 meters). When they are not sleeping or resting, Giant Pandas spend most of their time either looking for food or eating. On average, they consume about 30 pounds of bamboo in a day. This provides them with the nutrients they need as well as a considerable amount of their water intake. They are skilled swimmers and like going in the water. They often tend to live in close proximity to streams or other sources of water. A giant Panda is ready to breed between the ages of four and eight and can continue to do so until around age twenty. Ovulation occurs only one time each year, limiting the number of births for each panda to between five and eight during her lifetime. The female usually gives birth to two babies but can only care for one. The baby is looked after by the mother for up to three years. Newborn Panda babies weigh only 3 to 5 ounces at birth which is approximately 1/900th of the size of their mother. At birth, this makes them one of the smallest mammals on earth in comparison to the mother's size. They are born blind, hairless, pinkish white and completely helpless. It takes a lot of work on the mother's part to keep them alive. AT six to eight weeks old they will open their eyes for the first time and at three months they will begin to move around on their own.